Minden Place is a freehold residential project by Hai Hong Marketing Sdn Bhd located in Minden Heights, Penang. 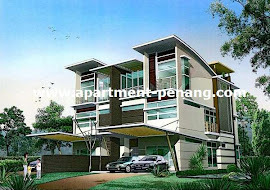 It is situated near to Palm Residences and Palm Palladium condominium. Minden Place consists of 3-storey semi-detached homes and bungalows, featuring a modern design with spacious built-up area of approximately 3,900 and 6,700 sq.ft. Other features include a built-in jacuzzi in masterbedroom, high quality finishing, quality homogeneous tiles and timber flooring. How much is this? I'm looking for semi-d around 1mil. Hi there, can i know how big the land size for this (type A) 1.42m?.. What is the price for standard unit ? From what I know there are only two units of type A left. The price is 1.5M and above. You can call the developer 04-2296053 to check it out.